Welcome back to a new term at DAN Taekwondo School. We have had a great year so far and hope to continue on with it. As usual we have lots planned for this term -seminars, some great lessons and of course the winter grading. As you are reading this you will have seen the brand new Student Area. We have updated this area with new information and will be rolling out extra features over the next couple of months. We want you to be able to access information as soon as we produce or receive it. You will see that we have mentioned that the front page for the Student Area is a Portal. It is your gateway into as much information as we can give you to help you or your child with their training and route to their next grading. We send a Newsletter out each month detailing any information about class times, updates and grading dates. It will also include winner of Student of the Month who will receive a certificate, medal and have their photo taken for the special Student of the Month area (great to show off in school!). If you are not yet receiving our monthly Newsletters and general emails, sign up on our special Newsletter page over here. And finally most of you know we are on those social networks. Our most popular network is Facebook, so do go ahead and give our page a like if you can. 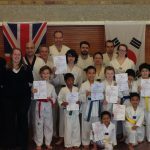 We are always posting videos and information from Taekwondo links around the world.